1 The eligible candidates are advised to attend for verification of Original Certificates at the above Helpline center. 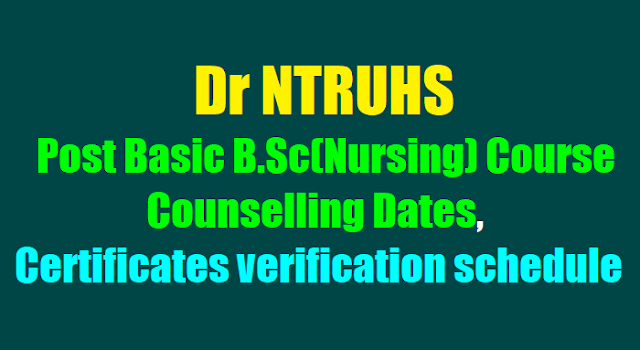 Candidates have to pay a non-refundable processing fee of Rs.1000/- for OC & BC (and Rs.800/- in case of SC/ST) at the time of Registration by way of Demand Draft infavour of the Registrar, Dr. NTR UHS, Vijayawada in any Nationalized Bank. 1. Candidate should have completed 17 years of age and should not be more than 45 years of age as on 31st December of the year of admission. In case of SC / ST Candidates the maximum age shall be relaxed by 3 years. b. Any other equivalent examination (10+2 pattern) recognized by the University in A.P. or Board of Intermediate Education Andhra Pradesh or NIOS, APOSS – as per Indian Nursing Council Regulations. & c. Should have passed General Nursing and Midwifery from an institution recognized by the Govt. of A.P. or Nursing Council of India and shall be registered with the State Nursing Council. e. Government Service Candidates: Should have completed 2 years of service as a staff nurse in Medical and Health Department and Andhra Pradesh Vidya Vydya Parishad as on 30.06.2017. Service certificate as a staff nurse should be enclosed issued by the respective employer and must be a regular employee. Service certificate, regularization orders as staff nurse should be enclosed. 2 SSC or any equivalent examination showing date of birth and other particulars of the candidate. 5 Service Certificate in case of Candidates in Govt. Service. 6 Transfer Certificate from the Institution in which the candidate last studied. 7 Caste Certificate in case of B.C./SC/ST Candidates. 8 Income Certificate for claiming tuition fee for reimbursement (EBC,BC,SC,ST Candidates). 9 Study Certificate from 9th to Intermediate and GNM Course. 10 10 Years Residence Certificate of either of the Parent or Candidate of the candidate who have not studied 9th to GNM / Intermediate in A.P. 11 Candidate claiming eligibility of reservation under PH quota should furnish the required certificate in support their claim. a. Permanent caste certificate from the M.R.O. / Competent authority of the native place of the candidate. 1 The Post Basic B.Sc., Nursing Degree Course is 2 years Course for Women Candidates only. The Seats in Government Colleges are only for Government Service Candidates. 2 The candidate should have completed 17 years of age as on 31-12-2017. The candidates who do not complete 17 years as on 31-12-2017 need not attend the counseling. The candidates born on or after 02-01-2001 are not eligible for admission into the above Courses. 3 The regulations and the details of seats available in various colleges and to exercise web options for admission into the Post Basic B.Sc., (Nursing) 2 YDC Course will be notified separately. 4 1. Candidates please note that this is the first and final phase of verification of original certificates. No further phase of verification of original certificates will be done. Candidates who got verified their original certificates can only exercise their web options in the subsequent phases if any. 5 The students belonging to SC/ST/BC/EBC/Disabled/Minority categories will be considered for reimbursement of Tuition Fee to the students is subject to verification and eligibility criteria prescribed by the State Governments of Andhra Pradesh. 6 Tuition fee as prescribed by the Government of Andhra Pradesh.